You are currently browsing the tag archive for the ‘tequila’ tag. A couple weeks ago The Boston Shaker hosted a tasting event with Barritt’s Ginger Beer and my obsession with the stuff has now been revived. I love the contrast of spicy and sweet and because it combines well with such a variety of other flavors it’s a must for any summer bar. Before the recipes, a bit about ginger beer. First produced in England in the mid-18th century, the early recipe included ginger, sugar, water, and lemon juice. This mixture was then combined with a yeast and bacteria combo, known as a ginger beer plant, which caused fermentation. Some of the early ginger beers could have had an alcohol content of up to 11%. Modern ginger beer, like the Barritt’s we sipped at the Boston Shaker, are not fermented, but rather carbonated (no boozy ginger beer here). Barritt’s was first produced in the 1870s by William John Barritt, a man looking to make a living to support his large family. 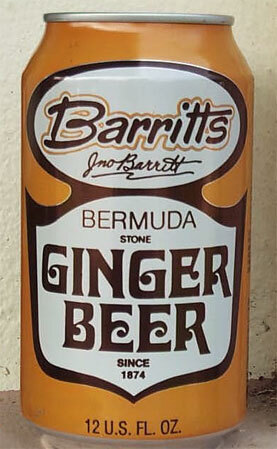 Barritt took advantage of a small bottling machine in a dry goods store in Hamilton, Bermuda, and a delicious ginger beer was born. My friend Anne Marie and I sampled all four drinks that were being mixed by Paul Imbesi. Two of the cocktails rose to the top. Shake over ice. Strain into a Collins glass filled with ice and top with 2 oz ginger beer. Garnish with lemon wheel. This is a great summer drink—the richness of the rye, the flowery-sweet St. Germain, and the tart lemon juice are brightened and heightened by the spicy ginger beer. I just love this drink. Muddle jalapenos, limes and agave. Add tequila and shake. Strain into a Collins glass filled with ice and top with 2 oz ginger beer. Garnish with lime and jalapeno wheels. Now this cocktail is not for the faint of heart (or taste buds)—this is quite spicy with both the jalapenos and ginger beer. This isn’t the kind of drink I would usually chose if I saw it on a menu, so I was a bit surprised by how much I enjoyed this. My advice for this weekend (and my own personal plan)—grab a six pack of ginger beer and get shaking and mixing. If you aren’t up for the recipes above, try something simple like a Dark and Stormy, a simple combo of a dark rum, ginger beer and lime juice. Cheers! Over the last couple weeks, the universe was doing its best to connect me and the margarita. First, my knowledge of the lyrics to Jimmy Buffet’s Margaritaville scored by team a few points at Tipple Trivia (did you know there are six items mentioned in the song that are either edible or drinkable?). Then, a Margaritas restaurant opened down the street from my house. And as the weather warmed and I started thinking about refreshing summer cocktails, I wondered does anything say summer quite like a margarita? Sure, I have enjoyed many of the sour mix variety, but a real one made with tequila, orange liqueur and fresh lime juice is oh, so much better! The agave of tequila adds a warm rich booziness, complimented by the sweet orange and tart lime. In making my first real margarita, I did a little taste test with my orange liqueur. I compared Hiram Walker Triple Sec and Cointreau*—first a blind tasting of the spirit on its own and then in a margarita. My taste buds preferred the triple sec, which was slightly sweeter and offered the orangey-ness that I was looking for both on its own and in the drink itself. I admit I was a bit surprised that the less expensive triple sec would have been preferable to the Cointreau, but it’s true. The origin of the margarita has its roots in a drink served in Tijuana in the 1930s—a Tequila Daisy, a combination of tequila, lemon and a sweetener. Margarita means daisy in Spanish. As most drinks do, this one also has its own glamorous creation myth. As the story goes it was the creation of a Texas socialite Margarita Sames for her 1948 Christmas party. It quickly made its way out of Sames’s Hollywood social circle into wider drinking circles to become one of the most popular drinks in America. Shake. Serve straight up or on the rocks in a salted-rim glass. Happy Summer! Happy Margaritas! Cheers! * I need to fess up here and acknowledge that I was provided with Hiram Walker Triple Sec and Cointreau free of charge.